The rise of double-crested cormorants: Too much of a good thing? matte-black bird with yellow-orange facial skin and a blue eye ring. Commonly found in fresh and salt water across North America, this relative of pelicans is an expert at diving to catch small fish. For centuries, people have viewed cormorants negatively. In classical literature, the word cormorant represented greed and gluttony. However, natural resource professionals have long recognized the ecological value of all wildlife, and cormorants are no exception. For example, as an upper trophic-level predator in aquatic systems, cormorants are useful indicators of environmental pollution and may contribute to limiting invasive prey populations. But over the last 40 years a major surge in the population of the double-crested cormorant (Phalacrocorax auritus) — a large, long-lived, fish-eating water bird and one of six species of North American cormorants — has led to negative interactions with other wildlife and society. In recent years, a host of real and perceived cormorant conflicts have been raised by various natural resource stakeholder groups and the public, with impacts to fisheries, aquaculture, co-nesting species and habitat heading the concerns (Dorr et al. 2014). So why do cormorants invoke such disdain? The bird’s widespread distribution, biology, behavior and history provide some insight into why they are perceived so negatively. Human persecution of the birds up to the early 1900s — largely due to perceived competition with fisheries and coupled with environmental contamination through the early 1970s — severely reduced the number of cormorants throughout North America. Reduction of contaminants such as DDT, regulatory protection and the birds’ adaptability to anthropogenic environmental changes facilitated an astonishing resurgence of the population. In the Great Lakes region alone, cormorants rebounded from around 200 nesting pairs in the early 1970s to 115,000 by 2000 (Taylor and Dorr 2003). For cormorants, however, and some other native wildlife species whose populations rebounded due to conservation efforts, this success led to other clashes. In the early 1990s when escalating conflicts with cormorants became a major concern, the birds became a management priority for the U.S. Fish and Wildlife Service, the federal agency responsible for overseeing species protected by the Migratory Bird Treaty Act. Following years of review under the National Environmental Policy Act, USFWS — in cooperation with U.S. Department of Agriculture’s Wildlife Services — developed new policies to address the conflicts. From these policies, the Aquaculture Depredation Order (AQDO) was issued in 1998 and the Public Resource Depredation Order in 2003 (PRDO). Collectively known as DOs, the AQRDO affected 13 and the PRDO affected 24 states. Overall, the DOs served to enhance the flexibility of farmers and management agencies to deal with local issues, including use of lethal control to remove nuisance birds, while ensuring the long-term sustainability of cormorant populations through USFWS review (Hanisch et al. 2011, Dorr et al. 2014). Since the USFWS issued the DOs, considerable effort has gone into managing the birds. Early on, federal, state and tribal agencies recognized that research and monitoring of the management activities would be desirable, not just to document damage, but also to provide feedback on the effects and whether management goals were being met. Since more extensive management of cormorants has occurred over the last two decades, a lot has been learned from these efforts and related studies. It helps to look at the issues separately. Fisheries. Impacts to fisheries are some of the most contentious issues associated with cormorants, particularly for the public, but also for wildlife and fisheries communities. In the 1990s, a growing body of research implicated cormorants in negative impacts on fisheries. The PRDO allowed authorized agencies to reduce cormorant numbers locally through culling and egg oiling or nest destruction, with an upper limit of 10 percent per year. Take beyond 10 percent of a breeding colony was permitted with advance notice of management methods, goals and expected impacts to cormorants and non-target species, provided the USFWS found no threat to cormorant sustainability. Since its inception, various agencies have attempted to manage cormorants under the PRDO in a variety of locations. Michigan’s Les Cheneaux Islands located in northern Lake Huron, home to an important recreational yellow perch (Perca flavescens) fishery, was one of the first. Some of the islands had been colonized by over 11,000 nesting cormorants. Research in the 1990s documented predation by cormorants on the fish, but the researchers concluded that the predation did not diminish the perch population (Belyea 1999). By 2000 the perch fishery had collapsed and subsequent research indicated that cormorants were a significant contributing factor to natural mortality rates as high as 85 percent (Fielder 2008). Conflicting research results such as these underscored some of the initial challenges in pursuing cormorant management, primarily how to assess impacts to fisheries and what constitutes actionable evidence. Research has since shown that cormorants tend to predate younger fish that may be under-sampled in typical fisheries mortality estimation methods, making assessment of effects on fish mortality difficult. Cormorant predation also can mimic poor reproductive success, which is often cited as a competing explanation for fishery declines. Researchers have observed this phenomenon with cormorant predation on perch and smallmouth bass (Micropterus dolomieu) and labeled it a “mortality bottleneck prior to recruitment” (Ridgway and Fielder 2013). A similar mortality pattern in perch was seen in the Les Cheneaux Islands. In 2003, following years of fisheries monitoring, research, review of management alternatives and public comment, the Michigan Department of Natural Resources and Wildlife Services partnered in an effort to manage the cormorant and sportfishery issues on these islands. We conducted the research in an adaptive management framework with pre-management modeling to evaluate effects of management on cormorant numbers and the a-priori selection of fishery and perch population metrics to evaluate management outcomes. With the underlying hypothesis that cormorants are a limiting mortality source, we conducted monitoring throughout the study to assess whether the management efforts effectively reduced cormorant numbers and foraging and to determine the relationship to the perch fishery response. (Dorr et al. 2012a, Fielder 2010). In 2004, we began efforts to reduce the cormorant population using egg oiling and lethal control of adults on the islands’ breeding colonies (Dorr et al. 2012a). Within six years, nesting numbers had been reduced by 90 percent, thereby reducing cormorant foraging in the area. All monitored perch population and fishery metrics trended upward, supporting the underlying hypothesis that cormorants are an influential mortality source. Even more significantly, cohort-based mortality rates of perch declined over the same time period to their lowest levels since 1996, allowing the perch population to increase (Fielder 2010) and indicating the success of the cormorant management efforts. But comprehensive studies evaluating cormorant impacts to fisheries such as this one are limited, owing to the cost and complexity necessary to draw reliable conclusions. In studies where cormorant control has been implemented and fisheries outcomes evaluated, however, fishery improvements have been observed (Dorr et al. 2012a, Schultz et al. 2013). The strength of evidence varies for each study and, in many cases, is complicated by other contributing factors. Nevertheless, these studies provided substantial evidence that cormorants were impacting local fisheries and that appropriate management can improve fish populations and fishing opportunities. Even with existing research, further study would be beneficial regarding issues such as predator thresholds, trophic effects and competition for prey in prey-limited situations (Ridgeway and Fielder 2013). Catfish aquaculture. Commercial production of catfish (Ictalurus spp.) is one of the largest aquaculture industries in North America. Due to favorable geologic, climate and socioeconomic factors, much of this catfish production occurs in the southeastern U.S. and the southern end of the Mississippi flyway (Dorr et al. 2012b). During the winter months, more than 60,000 cormorants can frequent these primary aquaculture-producing regions on any given day. Due to its economic importance, cormorant depredation on catfish farms has been studied extensively (Dorr et al. 2014). Direct predation impacts due to cormorants in western Mississippi alone were estimated at $5.6 million to $12 million annually (Dorr et al. 2012b). These regional impacts are important to the industry, but individual farmers also experience losses at the pond level. Researchers have documented that about 16 cormorants per day feeding on a six-hectare pond over the winter (October-March) can result in a 22 percent decline in biomass at harvest. Furthermore, even with buffer prey to reduce predation on catfish, producers suffer major financial losses (Glahn and Dorr 2002, Glahn et al. 2002). In fact, the sale price needed to break even can increase up to 11 percent per kilogram as predation rises (Dorr and Engle 2015). Given these losses, an enormous range of non-lethal management tools have been used to limit cormorant predation. Managers have tried pyrotechnics, propane canons, effigies, overhead wires, changes in aquaculture practices and laser lights, but all these methods have produced mixed success. Even when managers use multiple techniques in an integrated program, cormorants can become habituated to non-lethal methods relatively quickly. To date, research indicates that the most effective tools are non-lethal harassment and lethal shooting on the fish farm, and night-roost, non-lethal harassment and lethal shooting conducted primarily by producers and Wildlife Services (Dorr et al. 2012b). Wildlife Services organizes roost harassment efforts primarily in the aquaculture-producing areas of Mississippi and Alabama. In Mississippi, we designed the program to shift cormorants from night roosts near aquaculture to roosts along the Mississippi River where there is more natural foraging habitat (Dorr et al. 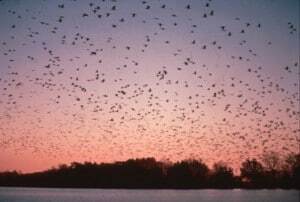 2012b), while in Alabama, the strategy is to move the birds to other roosts serving as unmanaged refugia. These programs have been successful in reducing cormorant foraging on nearby farms, with an estimated 10-percent annual shift of wintering birds to Mississippi River roosts resulting in $0.6 million to $1.2 million lower regional losses per year (Dorr et al. 2012b). Habitat and co-nesting species. Another contentious issue with cormorants has been extensive damage to vegetation where the birds nest. Excessive guano, associated soil chemistry changes and physical destruction are usually quite evident in these areas. These impacts can be relatively rapid, with trees dying within three to 10 years. Changes in soil have been shown to affect plant species composition, resulting in reduced numbers of species and opportunities for exotic, invasive plants to take over (Ayers et al. 2015). As vegetation dies, cormorants adapt and will often continue to nest on downed trees or the ground, eventually creating open areas devoid of almost all vegetation. Conflicts occur when these impacts happen on sensitive habitats or affect nesting habitat for other birds. In some cases, cormorants may directly compete for limited nesting space. On the other hand, some species that ground-nest in open areas may actually benefit from the habitat change. A number of efforts to manage cormorants are underway in the U.S. and Canada to address these issues. For example, the Ohio Department of Natural Resources, Wildlife Services and USFWS at Ottawa National Wildlife Refuge have collaborated to manage cormorants on West Sister Island in Ohio’s Lake Erie. Here, a sharp decline in numbers of nesting wading birds, particularly the great blue heron (Ardea herodias), coincided with increases in cormorants and damage to nesting habitat. The team developed and implemented a strategy in 2006 that incorporated monitoring programs with integrated wildlife damage management such as no-entry zones, habitat modification and culling. Annual culling reduced cormorant nesting pairs from a peak in 2005, which has since been fluctuating at or just above target levels of 1,500-2,000 since 2007. What’s more, there’s been a sustained, positive vegetation response to cormorant management as well as the maintenance of numbers of nesting pairs of wading bird species near management goals (ODNR 2013). Natural resource managers have the very difficult task of maintaining today’s biodiversity and ecological integrity while also meeting multiple societal uses. At times, this mandate has meant controlling abundant wildlife to benefit wildlife and habitats that are rare or to benefit human uses. In the examples described here, cormorants have not been extirpated from any of the areas by the wide variety of management techniques that have been employed, although many birds have been killed. As we build upon the lessons learned, agency collaborations and adaptive management frameworks will be essential to help reduce the risk of unexpected outcomes and to inform as well as refine management efforts in the future. In early 2016, a federal court ruling on a lawsuit to halt the DOs has put a hold on further management under these authorities. Nevertheless, cormorants remain very abundant in North America, and their population may continue to grow. It’s unlikely that cormorant-related conflicts and the need for management will end in the near future for these plentiful birds. Much has been learned about affected resources and management outcomes since the DOs were implemented more than a decade ago. In the future, this information will be useful for updating and refining cormorant management. Editor’s Note: A more extensive version of this article is being submitted to the American Fisheries Society’s Fisheries magazine. TWS Member Brian Dorr, PhD, CWB®, is a research wildlife biologist with the USDA Wildlife Services’ National Wildlife Research Center, an adjunct faculty member at Mississippi State University and past board member and current member of the TWS Wildlife Damage Management Working Group. Dave Fielder, PhD, is a fisheries research biologist for the Michigan Department of Natural Resources specializing in Great Lakes fisheries.